Now, while I have the card stock colours I needed, the only ink colour I had to match was Elegant Eggplant. What to do!! The solution I came up with is to paper piece my images. To do that, you simply stamp multiple images on the different coloured card stock, carefully cut out the portions you needed and adhere to the base image on your card! Easy peasy and really effective! Now, these colours on their own are bright, but put together and you need your Sunnies on, lol! So rather than make the card really over the top by adding embellishments, I chose to use only the colours for effect. 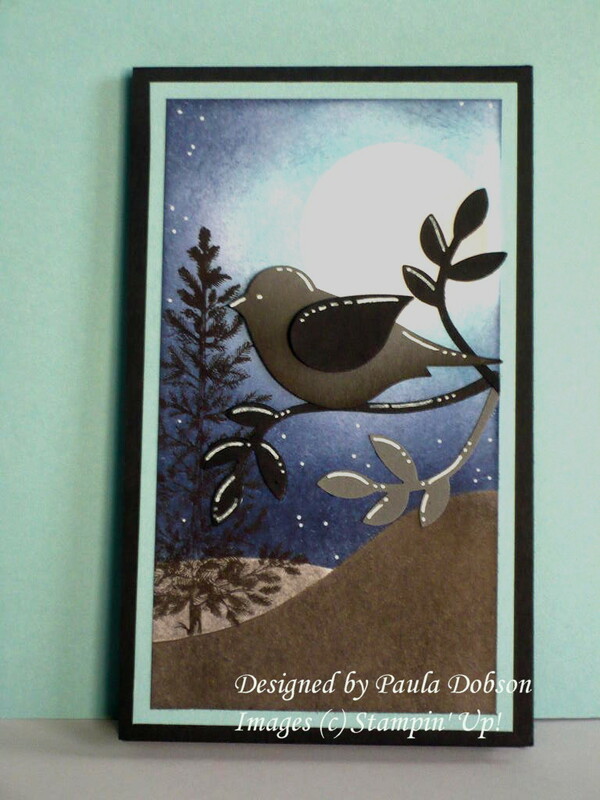 I also had the added interest of making an Easel card, rather than your garden variety stand alone card. 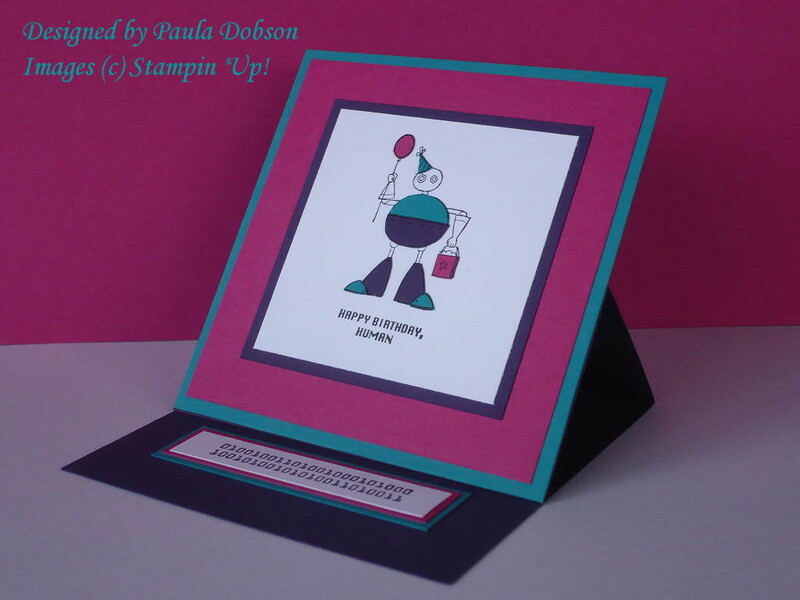 The stamp set I used is the new "Lots of Bots" from our Autumn/Winter Mini catalogue. 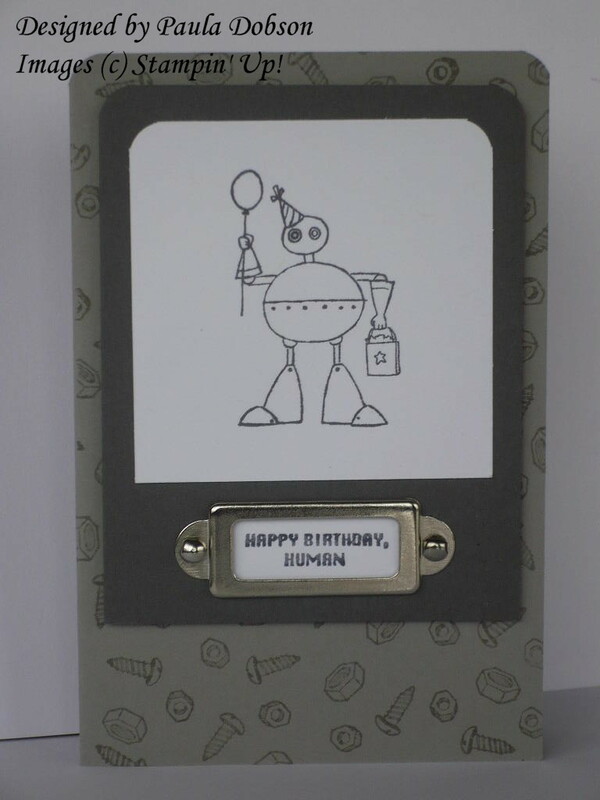 A really cute and male oriented set and great value at $29.95 for the set of 5 stamps. After all the glitz and glamor I have enjoyed over the last week, reality has hit with a bang. 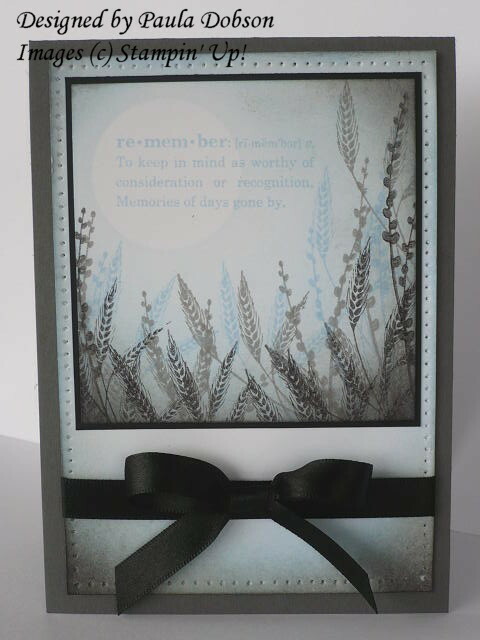 I had a call this morning asking for a Sympathy Card to be made for a friend. These are the hardest kinds of cards to do. I got my thinking cap on and came up with this card. Even though it is for a sad occasion, I am really pleased with it. I think it strikes the right cord, but still looks amazing. Can't get one of these in your ordinary card shop! Bonnie Thurber is the Director of Demonstrator Training. She is incredibly talented and hugely funny! 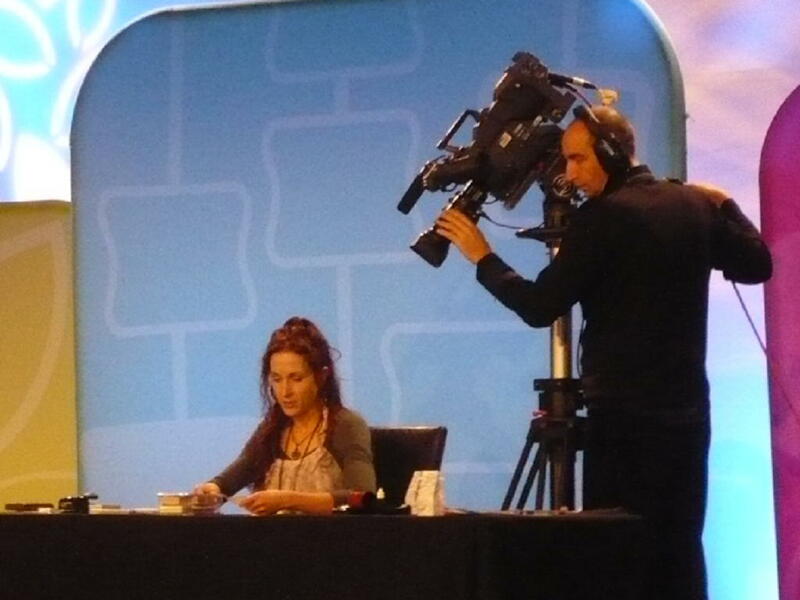 The poor women had to do a presentation to the entire gallery of Demo's with laryngitis! She pretty much had to whisper her whole presentation. Poor woman! We had a lot of training both as lectures and demonstrations. 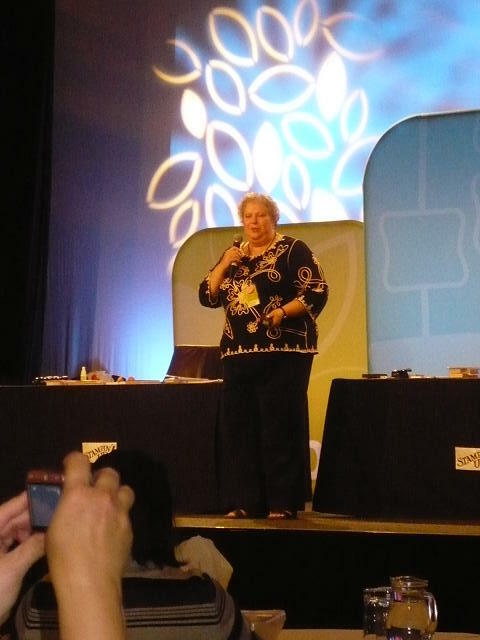 Here is Jacque Pedersen (Auckland) running through her presentation. I don't know how she kept so calm, not only in front of a few hundred Demo's but also with the cameraman hanging over her shoulder! All the presenters were fantastic! Jacque is also my Up-line. I live in Wellington and Jacque in Auckland, so it was fantastic to finally spend some fun and crafty time together! 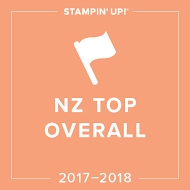 Jacque was also the 2010 Top New Zealand Demonstrator of the Year. Congratulations Jacque - we were all very proud of you!! I also got to meet many of my team members, who I know well Cyberly, but had never met in person! 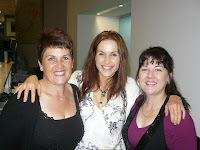 It was great meeting you all and I can't wait til June to catch up in Auckland with you all again! We were so lucky and received so many goodies at Convention. 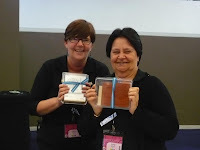 Karen Rogers and Sally Williams are grinning from ear to ear over the stamp sets they won!! Can you believe it? The trip to Sydney Convention 2010 is over after months of planning! What a time it was. Wish you all could have come with me! I have come home amazed, excited about this great business, and totally inspired by the wonderfully talented demonstrators I have met. Not to mention quite a bit of product heavier too! We all got the chance to Glam up too with the Awards Dinner on the Saturday night. We were all welcomed on the Red carpet with the essential Paparazzi present to record the event. 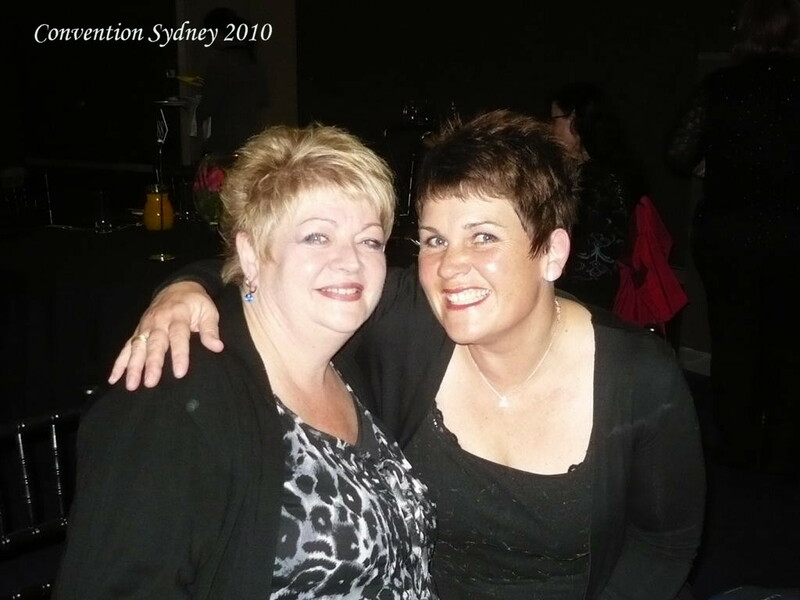 My two "besties" Diane Taylor and Bronwyn Heslop just looked so beautiful!! 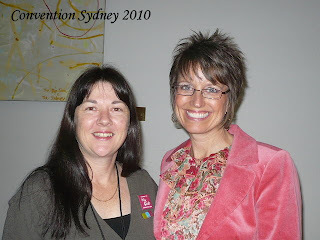 Of course, I was not going to turn down a photo opportunity with Shelli Gardner, CEO and co-founder of Stamp' Up! She is a beautiful and gracious lady, inside and out. I have a lot of photos to wade through, but wanted to show you all how much fun I have had over the last 5 days. Was well worth the huge effort to crank out those 85 swaps I made!! One of the most versatile sets I have in the SU range is "Lovely as a Tree". You can build scenes with this set, it is great for male oriented cards, just because cards, and even Christmas cards. I love sets that have multiple uses. In the month of June, I will be holding a couple of classes to spotlight this wonderful stamp set. Keep an eye on my upcoming events, and register your seat to see some of the delicious projects you can create with just one stamp set. 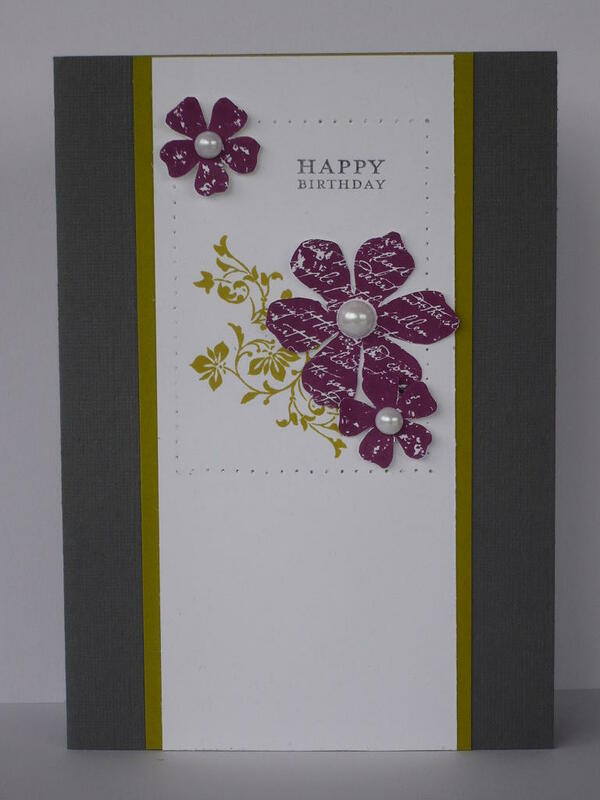 In the meantime, this is a wee card I demonstrated at the workshop I held for a lovely group of ladies yesterday. This wee gem doesn't need any embellishments, so makes for a lovely cheap card to make, but with a lot of WOW anyway! Of course, I can't demo anything without breaking out my sponges! 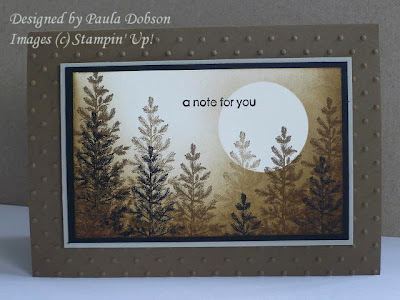 Using a post-it-note to mask the moon and sponging Soft Suede on Very Vanilla card stock, I very gently darkened the bottom of my Vanilla card. Removed the mask and stamped my Pine Tree image repeatedly to create the "forest". A simple sentiment and Viola! All Done! Well, it has been a while since I have been able to sit down and do some of my own artwork (in the shape of sponging, of course! ), but I finally got a small window of opportunity last weekend! A few months ago, I created an altered note pad as a team swap, and had a huge response to it. I thought I would do another, which I plan to use as my door prize for a workshop I am taking this Saturday. Let me know what you think of the birdie!!! 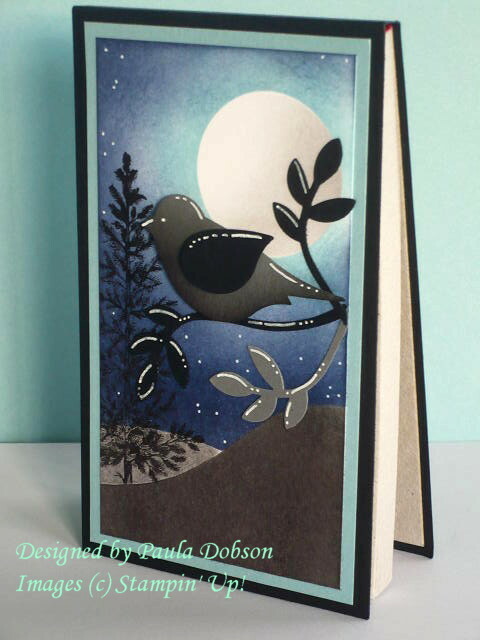 I have used the new 2 Step Bird punch available in the Autumn/Winter Mini catalogue. I have seen so many wonderful projects used with this punch - and not restricted to birds either! A great value and versatile punch at $35.95. Altering your own items makes them so personal and great to give as gifts. 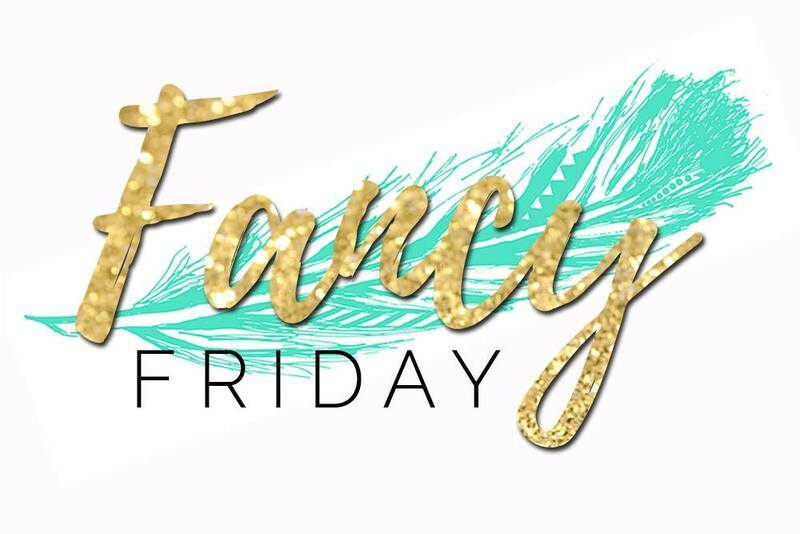 Whenever I go shopping, I am always on the look out for things I can either recreate or alter! I would love to get something like this, if I knew it was made especially for me!! I also plan to have some of these pads available for sale at the Upper Hutt Crafters market, which is on the first Saturday every month. Why not drop in, say Hi, and pick one up for someone special? I taught a class in the weekend on flower embellishments and just had to show you one of the projects my ladies made with the embellishments they learnt. It is called a "Flower Pot" card (don't know why!,lol). This was the first one I have ever made and yet I have seen many gorgeous examples on the net. I was pleased with how my first attempt turned out! The flowers have now been done by so many people, that I have no idea who actually came up with the originals, but THANK YOU, whoever you are! The Carnations were made with 8 layers of tissue paper and once put together I dragged them through an ink pad to get the variegation effect going on. The Pansies were punched with the Butterfly Punch (which you can still purchase at $39.95) on watercolor paper, then I used my Aqua Painter to fill in the colour. Watercolour paper works so well for soaking up ink as it acts like a sponge. Once you know how to make these little beauties, you really have no excuse to buy embellishments when you can make your own. 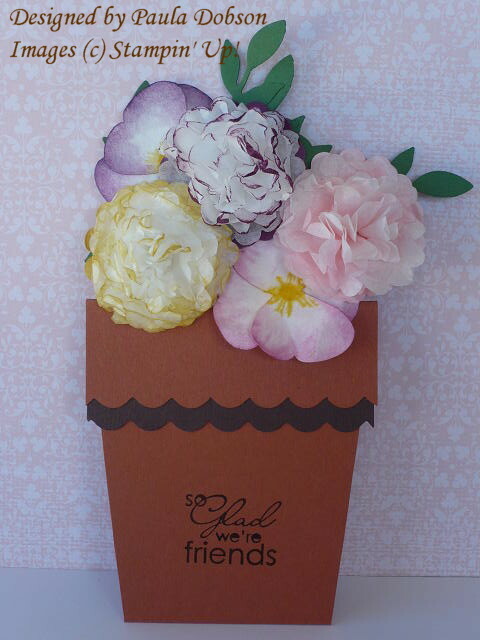 If you couldn't make this class, but would like to know how to make these flowers, I am happy to bring the class to you! Just email your interest and I will give you more details! I am teaching a workshop for some crafty crafters on Monday night and I thought I would share with you the "Door Prize" for some one lucky enough to draw it. I always like to give an item of inspiration as my door prize. This little bag is a great example of how to use your 12x12 papers on something other than a scrap book or card. I got the tutorial from one of my team mates, Julia Leece, when I saw her creation on her blog. Pop by and say Hi! 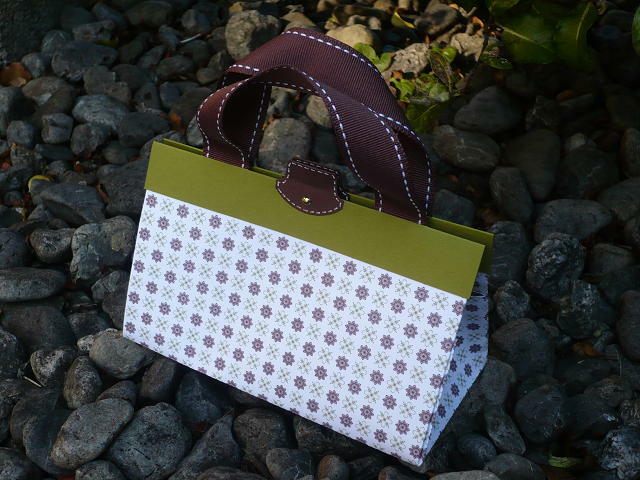 This is one of the easiest bags I have made! I also like to include a couple of other items, normally a wee note card and chocolate! Who doesn't like to receive freebies!! This wee gift is just one of the freebies my guests or Hostesses get to keep. Why not book a workshop with me and get a little free inspiration too?! I have shared with you the card I made for my Mother a few posts ago and now I would like to show you the one I made for my darling Mother-in-law. She is 85 years old, and an amazing woman. I love her to bits. 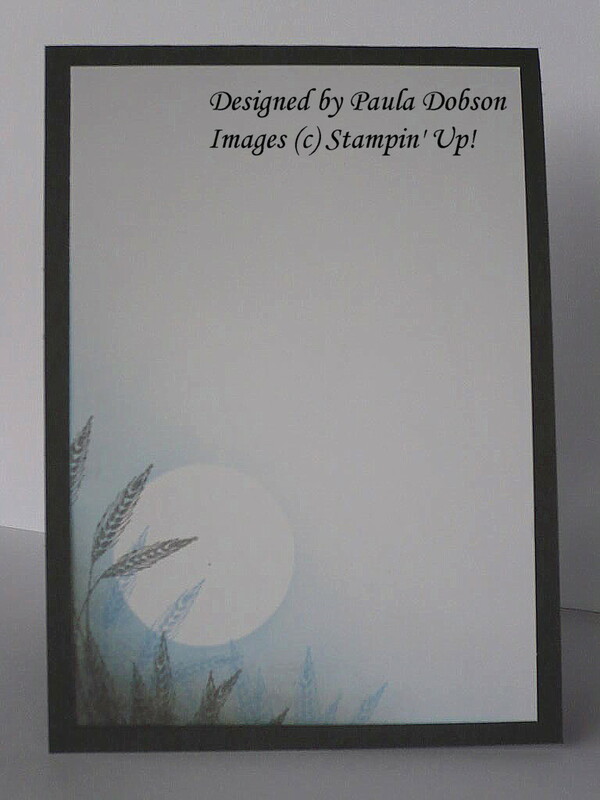 It is the first time I have used Asian Artistry, which is a new level 2 Hostess set. It is a beautiful set and I knew I just had to have it! You can have it too, with a qualifying workshop. So, don't waste time - book your workshop with me today! 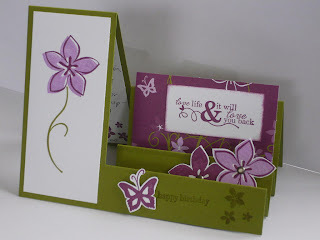 I have stamped and coloured on our watercolour paper, cut out and used dimensionals to add three layers to the flower. It is kinda hard to see in the photo, but it gives the image a real 3D look. I have sponged Certainly Celery onto Whisper White card stock, darkening as I went toward one corner. 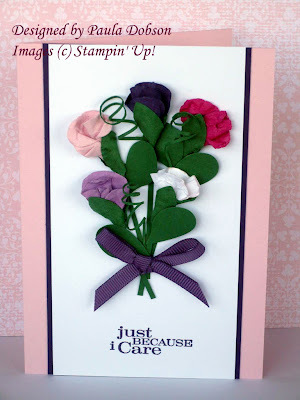 While I was blog hopping this morning, I came across a gorgeous tutorial for Sweetpeas. Well, not only did I have to have a go at making them, but I had to share them with you also. The very talented Judy Marshall from Canada created this tutorial and has some lovely projects. So go pay her a visit! I have a class on Saturday demonstrating and teaching how to make your own flower embellishments. 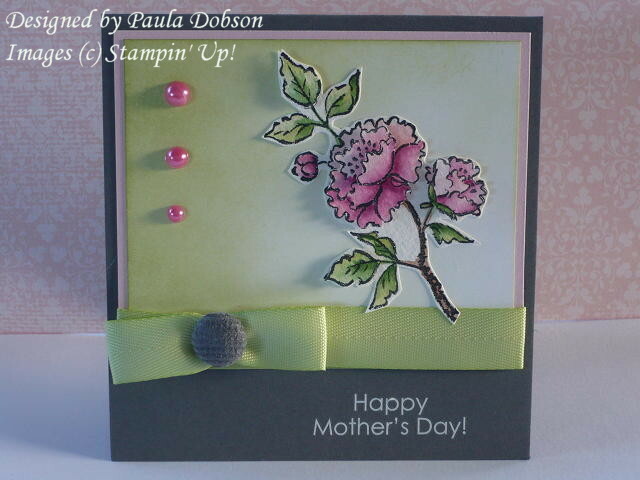 I can't help it, I just had to add this gorgeous card into the mix as well. I hope may ladies are prepared to get nice and sticky, hehe! 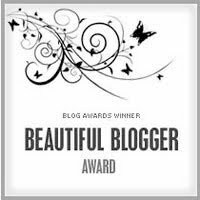 Thank you Karen for nominating me for the beautiful Blogger award. It is such a privilege to be considered for things like this. The talent out there in cyberspace is phenomenal!! In order to keep it I need to pass this on to 10 blogs that I think deserve the award and then list ten things about myself that you may or may not know. 2. 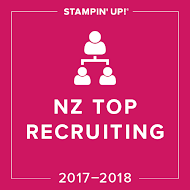 I work part time for an Accountant, but my real job is Stampin' Up! 3. I love to read before I go to sleep. 9. I am an Army brat and lived two years in Singapore when I was a little girl. 10. I am left handed, but don't hold that against me! Thanks for stopping by. 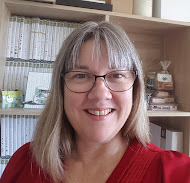 Now go and check out the fabulous blogs I have listed above. Ciao! 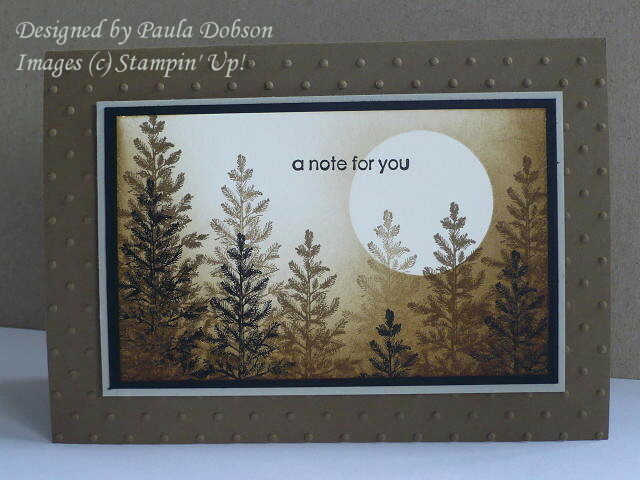 Do you know, since I became a Stampin' Up Demonstrator I have met the most amazing and generous people!! 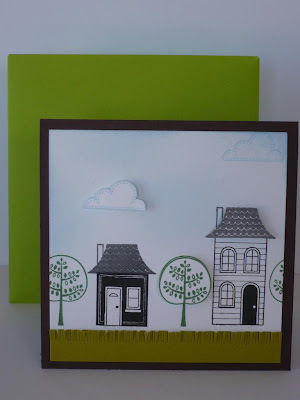 I am always in awe of how clever we crafters are when I see some of their blogs. Today, I had the most lovely comment left on my blog and was awarded the Sunshine Award by the lovely Danielle! Thank you Danielle you have brightened up my week! Here are the 'rules' for the award. The hardest part, of course, is narrowing it down!! 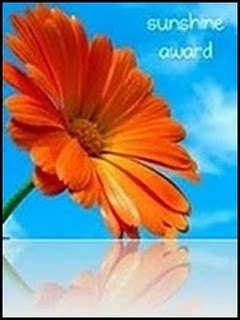 I hope this award brightens your day girls. It sure did mine!